Manfrotto, world leader in the photography, videography, imaging equipment and accessories industry, has announced the release of the new 500 Video system. Designed for videographers looking for a video system that is both easy to carry and versatile, the 500 Video System can support small camera systems up to 5kg. Based on the market leading 190 tripod technology, the MVK500190XV features D shaped tubes which ensure rigidity when you are shooting. The Quick Power Locks (QPL) provide a secure locking grip, and can be locked and unlocked with just one hand in a single movement, meaning a quick and easy set up when you need it. Each of the 4 leg angles can be set individually for flexible positioning ensuring that you get the shot you want. The innovative levelling column is perfect for smaller camera setups and allows for quick levelling of the head as well as the option to make quick height adjustments for perfect framing. The inclusion of 3 grub screws on the top disc that eliminate movement by locking into the head and a levelling bubble allow for fast levelling on any surface. The 500 Fluid Video Head is lightweight and ensures smooth shots. The fluid cartridges fitted on both the pan and tilt axis make any shot controlled and precise. With a pre set counterbalance of 2.4kg, it is perfect for CSC and DSLR rigs as well as dedicated smaller video cameras. The snap-lock, sliding QR plate allow the camera and sliding plate to quickly click in the head from above making it quicker and simpler to both click the camera into place, and lift the camera out of the head from above. The Easy Link connector can be used to attach anti rotation accessory arms – perfect for external monitors, audio recorders and more. The ability to easily and securely fasten accessories using the Easy Link connector on the tripod plus the additional connector on the fluid head mean that you can rig up your perfect set up with ease. 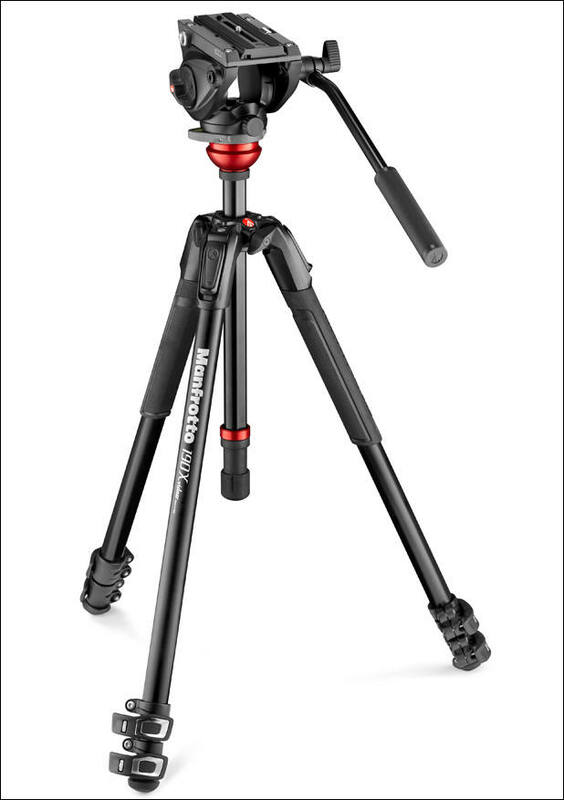 With a maximum height of 173.3cm and a closed length of 72.2cm, this latest, high performance kit from Manfrotto is a perfect choice for any videographer looking for an adaptable, easy to use and secure system.